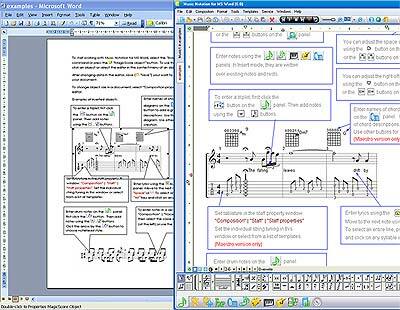 Music Notation for MS Word makes it easy to enhance Microsoft Word documents with music notation. The product combines the power of MagicScore Maestro 6, one of the most powerful music notation editors, with world's most popular text processor, allowing to produce music literature, articles, brochures or tutorials complete with music notation, and sending Word documents with sheet music to anyone, even if they don't have Music Notation installed. Instantly play your favorite songs, without having to download them! Qweas is providing links to Music Notation For MS Word 1.555 as a courtesy, and makes no representations regarding Music Notation For MS Word or any other applications or any information related thereto. Any questions, complaints or claims regarding this application Music Notation For MS Word 1.555 must be directed to the appropriate software vendor. You may click the publisher link of Music Notation For MS Word on the top of this page to get more details about the vendor.